DI POTER PARTECIPARE AL DI POTER PARTECIPARE AL SEMINARIO “REVISIONE DELLA PRATICA” CHE SI SVOLGERÀ A: MILANO ( HOTEL B&F in VIA BUTTI 9) NELLE SEGUENTI DATE: 2 - 4 MARZO 2019. 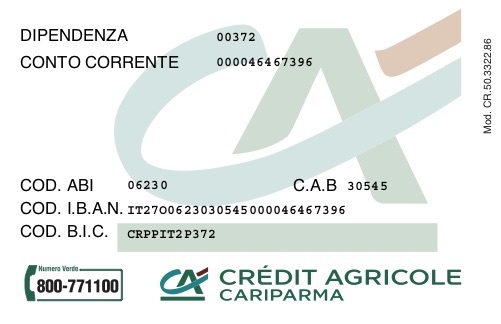 DICHIARA DI ESSERE A CONOSCENZA CHE IL CORRISPETTIVO DA VERSARE PER LA PARTECIPAZIONE AL CORSO È COMPLESSIVAMENTE PARI A €420,00 (QUATTROCENTOVENTI/00) OPPURE SE AFFILIATO AIRPG € 390,00 (TRECENTONOVANTA/00), DA VERSARE CONTESTUALMENTE ALL’INOLTRO DELLA DOMANDA DI ISCRIZIONE, MEDIANTE BONIFICO SUL C/C BANCARIO APERTO PRESSO LA CARIPARMA E PIACENZA- AGENZIA DI IVREA – IBAN IT 27 O 06230 30545 000046467396. L’ISCRIZIONE POTRÀ INTENDERSI PERFEZIONATA ESCLUSIVAMENTE AL MOMENTO DEL RICEVIMENTO, DA PARTE DI AIRPG, DEL BONIFICO BANCARIO. LA PRESENTE RICHIESTA DI ADESIONE DOVRA’ PERVENIRE ENTRO E NON OLTRE IL 15-02-2019. RICHIESTE DI ADESIONE PERVENUTE DOPO TALE DATA NON COMPORTERANNO ALCUN VINCOLO PER AIRPG, LA QUALE, TUTTAVIA, AVRÀ FACOLTÀ DI COMUNICARE ALL’INTERESSATO L’ACCETTAZIONE DELL’ISCRIZIONE PERVENUTA FUORI TERMINE.